It is said that King Preah Thorng married the daughter of the Naga, Princess Neang Neak. Through their marraige, the Khmer people are descended from the Naga. Nagas represent prosperity and the spirit of the land and water of the Khmer. It is not surprising based on the story that nagas are a common decoration on Cambodian temples. They tend to appear on bridges or as seven-headed statues. The naga symbol is an important one to the Cambodians. 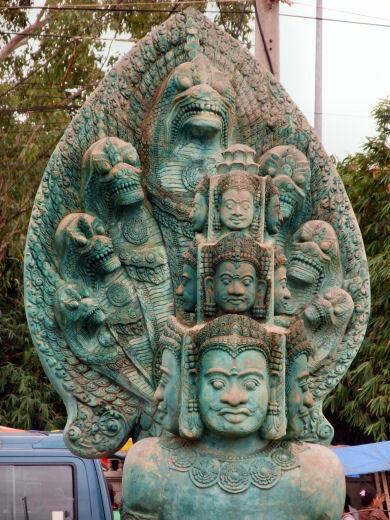 When Cambodia hosted the GMS Summit 2002, they chose a seven-headed naga to symbolise the Khmer culture and the cooperation between the countries at the summit. Under this rubric are snakes, usually of the python kind (despite the fact that naga is usually taken literally to refer to a cobra,) deities of the primal ocean and of mountain springs; also spirits of earth and the realm beneath it, and finally, dragons. In a Cambodian legend, the naga were a reptilian race of beings who possessed a large empire or kingdom in the Pacific Ocean region. The Naga King's daughter married the king of Ancient Cambodia, and thus gave rise to the Cambodian people. This is why, still, today, Cambodians say that they are "Born from the Naga. 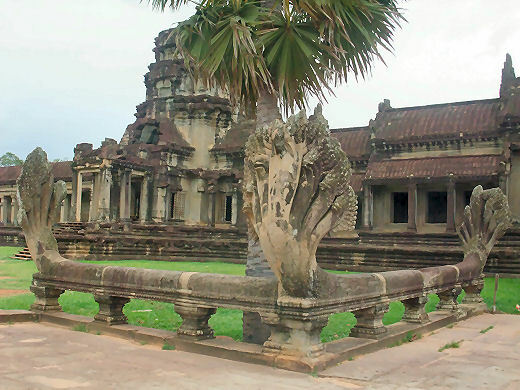 The Seven-Headed Naga serpents depicted as statues on Cambodian temples, such as Angkor Wat, apparently represent the seven races within Naga society, which has a mythological, or symbolic, association with "the seven colours of the rainbow". Furthermore, Cambodian Naga possess numerological symbolism in the number of their heads. Odd-headed Naga symbolise the Male Energy, Infinity, Timelessness, and Immortality. This is because, numerological, all odd numbers come from One. Even-headed Naga are said to be "Female, representing Physicality, Mortality, Temporality, and the Earth."